Eighty percent of Mongolia is extensive grazing and a further ten percent is forest or forest scrub that is also grazed. Its climate is arid to semi -arid and the frost-free period of most of the steppe is one hundred days; transhumant herding on natural pasture is the only sustainable way of using such land. Cattle, with yak in the higher areas, horses, camels, sheep and goats are raised; local breeds are used. During the past century management has changed from traditional transhumance, to collectives that retained herd mobility from the fifties, to private herding from 1992. While livestock are now privately owned, grazing rights have not yet been allocated; this causes problems for maintenance of pastoral infrastructure and respect of good grazing practice. Stock numbers have risen since privatization and are now above the previous high of 1950; weakness of the traditional export market and increase in the number of herding families are contributing factors. Pasture condition is generally sound, although, recently, localized overgrazing has occurred close to urban centres and main routes. Considerable tracts are undergrazed because of breakdown of water supplies or remoteness from services. Major improvement of grazing management and pastoral production requires enactment of legislation appropriate to the new management system and organization of the herding population. Increased family hay production from natural herbage would improve overwintering survival. Transhumant herding of hardy, local stock, has proved sustainable over centuries and is still thriving. Mongolia is one of the few countries that is truly pastoral and its economy depends largely on livestock, with little crop production, forestry or industry. The cold, arid climate is only suitable for extensive grazing and transhumance with local, hardy breeds, which are still used, with few inputs other than the hard work and skill of the herders (Plate 7.1). This ancient grazing system has proved productive and sustainable through the political changes of the past century. The grazing lands are in good condition and the local breeds intact and thriving; this contrasts with the situation in some neighbouring countries that are now facing the consequences of excessive use of exotic breeds and reliance on bought, imported winter feed. Mongolia lies between 42° and 52°N and 88° and almost 120°E. About half the land is above 1 400 m. It is completely landlocked, bordering the Russian Federation and China (Figure 7.1) and with well -defined natural boundaries delimiting the Mongolian steppe: the Altai and Gobi Altai mountains to the west and southwest, the Khangai mountains in the central north, the Gobi desert to the south and the taiga to the north; these facilitate neither trade nor transport. Access to the sea is through the Chinese port of Tianjin, 1 000 km from the frontier. There are very few hard-surfaced roads; the main Russia-China railway traverses the country, but there are few internal lines. Livestock move to market by droving; other commodities have to be transported over poor, unsurfaced roads and tracks. The pastoral and climatic situation has close parallels in neighbouring parts of Inner Asia: Buryatia, Tuva and some Chinese regions (Inner Mongolia Autonomous Region and the northern part of Xinjiang Autonomous Region), although the Mongolian economy and lifestyle are much more pastoral and its crop sector vestigial. Under slightly different climatic conditions, experience in the transition from collective to private herding is also relevant to parts of Central Asia - Kazakhstan, Kyrgyzstan and Tajikistan. Mongolias pastoral industry was less drastically modified by collectivization than that of the CIS countries in that herder mobility was maintained as the key to assuring year-round feeding and risk avoidance, and hardy, local breeds remained the basis of the industry. Technologies and strategies developed in Mongolia may have relevance throughout the region. Ger and sheep fold on summer pastures - Arkhangai. Extent of grasslands in Mongolia. Gobi - desert steppe and desert (580 000 km2). NOTES: (1) Figures from the early 1990s. Much of that is now fallow. SOURCE: Ministry of Agriculture and Food. Mountain pastures above larch forest with yak - Zaghvan. Extensive livestock production is, by far, the countrys major land use and industry, as can be seen from Table 7.1. The level-to-undulating topography of the Mongolian plateau is frequently interrupted by low mountain ranges and is surrounded by rough topography. Luvic xerosols associated with Orthic Solonchaks occupy the greatest part of the land: the steppes and the Gobi desert. Associations of Haplic Yermosols and Orthic Solonchaks also occur. Luvic Kastanozems associated with Orthic Solonchaks occupy a large area in the north and east, the best of Mongolias pasture lands. Mountain ranges are covered by Lithosols associated with Luvic Xerosols or Haplic Yermosols (FAO/UNESCO, 1978). The climate is cold, semi -arid and markedly continental. High mountain ranges isolate the country from the influence of the Atlantic and Pacific climates. The Siberian anticyclone determines the low temperature in winter and the low precipitation. The frost-free period at the capital is around 100 days. There are four distinct seasons: a windy spring with variable weather - spring rain is especially valuable to get the pasture growth started before the main summer rains; a hot summer, with the main rains falling in the earlier part; a cool autumn; and a long cold winter, with temperatures as low as -30°C. The growing season is, therefore, generally limited to about three months. Precipitation is low, much falling between June and September. The largest grazing areas, the steppe and the mountain steppe and forest, get between 200 mm and 300 mm annually; the desert steppe receives between 100 and 200 mm; the desert gets below 100 mm; only the northern zone has over 300 mm. Most of the precipitation returns to the atmosphere through evapotranspiration; about four percent infiltrates to the aquifer and six percent contributes to surface flow. Strong winds (with velocities in excess of 20 m/s) are common in spring and early summer, and then dust storms can bring disaster to people and livestock. Such storms are commonest in the drier tracts. The vast majority of the nation, about 80 percent, is Mongol; the extreme west is inhabited by Kazakhs and there are some reindeer people in the extreme north. Buryats, Tuvans and other Mongol-related peoples make up the rest. The total population has risen sharply, more rapidly than livestock numbers, tripling since 1950 (see Table 7.2). The degree of urbanization rose very steeply on collectivization. Originally urban dwellers were only 15 percent, but ten years on this had risen to 40 percent and by 1989, the end of the collective period, the urban population was 57 percent, including those in the sum centres. The 1997 figures show a slight decrease in the proportion (but not number) of town dwellers, perhaps reflecting some families returning to herding. The population rise since 1950 has been large and rapid: the projections for the next twenty years (Table 7.3) show no slowing down, but rather a near doubling! Education from 6 to 16 has been compulsory for many years and the level of literacy in the population is very high. There are strong training institutions to university level - many post-graduates have trained abroad. There are technical schools in each aimag (? province). More girls than boys follow secondary and university studies - their families do not require them for herding and there are adequate women to attend to dairy duties. Population change, rural-urban distribution and total (000s). NOTE: n.a. = information not available. Projected total population to 2020. SOURCE: Development scenario for 21st century. UNDP pilot project report. Ulaanbaatar, 1998. MAP-21, MON/95-G81. Migrating flock crossing the Ulan Dava pass on the way to summer pasture - Uvs. The herders all practice transhumance; this means that they must move seasonally (see Plate 7.3) with their livestock on the pastures. They live in gers (yurt in Russian), cylindrical, domed structures (Plate 7.4) with a wooden framework covered with felt; They are free-standing, not held in place by guy-ropes like a tent. While the ger is easy to take down and erect and domestic equipment is designed for ease of transport, the moving of the familys gers and baggage requires frequent hard work and transport. Fuel for cooking and heating is generally dried dung, except in the forest zone, where firewood is also used. Mongolia is rich in wildlife and its herds share the grazing with antelope, gazelle, elk and deer. Rodents are widespread and can cause much local damage to grassland through feeding and burrowing; control was once done through poisoning but this has now stopped. There are abundant predators, hawks, buzzards, eagles and foxes that feed on them. Wolves prey on sheep flocks and in the Gobi Altai the protected snow-leopard may cause damage. Crops and industry are very minor components in the present national economy; mineral resources have yet to be tapped on any scale, the forest area is relatively small and slow-growing. Agro-industrial processing, almost entirely livestock-based, has contracted since economic liberalization. Traditionally, herders did not till the land; their economy and life-style was entirely pastoral and the climate gave little incentive to do so with the technology available to them. A little irrigated cropping, mainly wheat and barley, was done in the region of the Great Lakes and the grain parched and ground to a pre-cooked flour (similar to the tsampa of Tibet). With the availability of suitable agricultural machinery during the second half of the twentieth century, however, it became possible to undertake large-scale cereal production (Plate 7.5): in some of the less unfavourable areas of Central Mongolia over one million hectares were cultivated. The land used was, of course, among the best pasture. Some fodders (discussed in detail below) and potatoes were also grown, but the area was small compared to that of grain. The technology used, based on a rotation of alternating strips of crop and fallow, was adapted from Canadian practice. State farms and negdel (see Plate 7.6) in suitable sites produced enough grain to satisfy the populations needs - more cereals were eaten during the collective period than previously or nowadays. FAO (1996) quotes a 40 percent reduction in the consumption of flour. In a semi -arid area with a very short thermal growing season, all agricultural operations must be carried out very rapidly, especially seed-bed preparation and sowing; yield potential is low, so production methods have, therefore, to be extensive. Considerable seasonal risk is involved and harvest can be difficult if a dull summer delays ripening or there is early frost or snow. Cropping is not attractive to smallholders. Production was highly mechanized, and field sizes large - over a square kilometre. Harvesting was by combine harvester, often with assisted drying. Straw was recovered as feed and handled mechanically - some straw was ground up as a component of "concentrate" feed. The fallow strips had to be cultivated in summer to control weeds and prepared for the coming years crop. 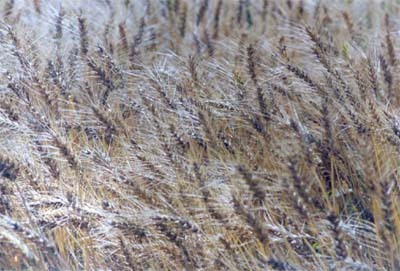 Wheat was once grown over much larger areas in Mongolia. Mountain and steppe with negdel complex in background - Tuv. With the collapse of the former producing organizations, the crop area is greatly reduced, although some companies are still active. There are many financial as well as technical problems, including seed supply and competition from imported flour. The country is now very much dependent on its neighbors for grain supplies, a problem for national food security. Much of the former crop land is in tumble-down fallow, the area is not known but it is estimated that 700 000 hectares could be recovered for cropping; this provides some grazing but would require continual weed-control work were it to be cropped. Straw is not, therefore, an important source of fodder. "Banners were the main administrative units of the Manchu government in Inner Mongolia and Mongolia. They approximated in area to the present counties (banners) in Inner Mongolia. In Mongolia, territories of banner size no longer exist; they were amalgamated into aimags, which are divided into sum (more numerous and mostly smaller units than the previous banners). The traditional practice in the pre-revolutionary period in the open steppes of Inner Asia was based on general access to the bounded pasture territories coordinated by leaders and officials. In Mongol inhabited areas, along with small herder groups of a few families, there were large institutions, notably Buddhist monasteries and the economies of banners [administrative units] managed by the ruling princes. These institutions held their own property or funds (jas) consisting of livestock, land and money. In Mongolia and Inner Mongolia the animals were herded by monastery serfs (shabinar) or banner princes serfs (hamjilaga), while a further class of State subjects (albat) paid taxes and performed labour services. The large monastic foundations, with their own territories and people, functioned as districts equivalent to banners, but there were also numerous smaller monasteries located inside the princely banners." Feudal land ownership was done away with on the founding of the Mongolian Communist State in 1921; transhumance continued with government, instead of feudal, supervision. In the late thirteenth century, Marco Polo described the Mongol transhumance and their gers (Latham, 1958: 67). "They spend the winter in steppes and warm regions where there is good grazing and pasturage for their beasts. In summer they live in cool regions, among mountains and valleys, where they find water and pasturage. A further advantage is that in the cooler regions there are no horse flies and gad flies or similar pests to annoy them and their beasts. They spend two or three months climbing steadily and grazing as they go, because if they confined their grazing to one spot there would not be grass enough for the multitude of their flocks. They have circular houses made of wood that they carry about with them on four-wheeled wagons wherever they go. The framework of rods is so neatly and lightly constructed that it is light to carry. And every time they unfold the house and set it up the door is always facing south. They also have excellent two-wheeled carts - these are drawn by oxen and camels. And in these carts they carry their wives and children and all they need in the way of utensils." Polo continues with more that is still apposite: "And I assure you that the womenfolk buy and sell and do all that is needful for their husbands and households. For the men do not bother themselves about anything but hunting and warfare and falconry." The countrys pastures have probably always been heavily stocked - hard grazing is a historical phenomenon, not something of recent development. Kharin, Takahashi and Harahshesh (1999) quote Przevalsky (1883) who "said that all suitable agricultural lands were reclaimed and all grazing lands were overloaded by livestock." A fundamental change took place in 1950 with the collectivization of the livestock industry; while this facilitated the provision of government services and marketing (and probably control of a nomadic population), it decreased the range over which herds could travel and thus reduced opportunities for risk -avoidance in times of feed scarcity. The unit of management during the collective period was the negdel covering the same area as a single district (sum); it was primarily an economic unit responsible for marketing livestock products, supplying inputs and consumer goods as well as fodder and transport services to members; it provided health, education and veterinary services. Although livestock was collectivized, each family was allowed to keep two livestock units (bod) per person so about a quarter of the herd was under private control. Collectivization, as noted above, led to a very large rise in the proportion of urban population. During the collective period, the government was heavily involved in livestock production through the provision of breeding stock, fodder, marketing, transport and services. It was a heavily subsidized production system that did not allocate resources efficiently. 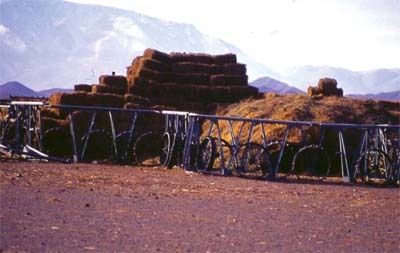 The loss of mobility through collectivization was compensated by the production of supplementary forage and a State Emergency Fodder Fund was established as a mechanism to provide feed during weather conditions that would threaten survival, but, with heavily subsidized transport and undervalued prices, herders soon became dependent on it as a regular source of feed. By 1991, the State Emergency Fodder Fund was handling 157 600 t/yr and had become a major component of the state budget. A network of stock-routes was maintained that allowed slaughter stock to be trekked to market, fattening en route. There were marketing and primary processing facilities for hides, skins, wool and cashmere. Eighteen aimags were subdivided into 225 districts - sum - that in turn were divided into brigades. Negdel headquarters had administration, schools(boarding), medical facilities, a veterinary unit, communications, recreational facilities and shops. Negdels were set production quotas and paid accordingly with bonuses - the system was production driven. A vast number of salaried administrators and specialist staff was built up at all levels, especially in the capital. Negdels were divided into production herding brigades or teams, which were further sub-divider into suuri - individual units made up of one to four households (sur). There were other, salaried, brigades for haymaking, mechanization, etc. Brigades had production targets for each sur, determining the quantity of meat, wool and other products to be delivered according to the annual state procurement order. A sur was generally involved in the production of single-species herds for which a monthly salary was paid (each household, however, had some private livestock for subsistence). Pasture management was organized along rational lines and the seasonal movement of herds (and resting of grazing land) planned and the plans followed by the sur. Emphasis was on animal output rather than pasture improvement but the system did assure better pasture management than todays anarchy. Hay lands were reserved and managed separately from grazing. The negdels were privatized in 1991; this was meant to take place in two stages. Thirty percent of negdels assets were distributed between members; a further 10 percent of the livestock was distributed to sum inhabitants (administrative and health workers, etc.). The remaining 60 percent of assets was formed into a limited liability company; these companies were generally unsuccessful and the livestock industry reverted towards its earlier family-based transhumance. In some cases the livestock were distributed without the formation of a company. The natural grazing has a very short growing season, limited by low temperatures. Pasture growth begins in mid-May and usually ceases after mid-August because of drought. Frosts can occur at the end of August; the thermal growing season is shorter in the mountains and longer in the Gobi. The grazing lands were surveyed in detail and pasture maps covering the country produced about twenty years ago. Under negdel management, pastures were monitored and seasonal movements of livestock respected. The monitoring of pasture condition needs updating so that the present situation can be defined and policies formulated on a basis of fact rather than opinion. The dichotomy of interests between the grazers and the grazed is recognized at government level: livestock are under the Ministry of Agriculture and Food while the grazing lands and the monitoring of their vegetation are the responsibility of the Ministry of the Environment and Natural Resources; close inter-ministerial collaboration is essential in any work on pasture management at national level. Opinions on the present state of Mongolias pastures vary widely, especially those of external missions. There is general agreement that overstocking now occurs close to agglomerations, especially the capital and along roads. Damage through random track-making by vehicles, particularly in valley-bottoms, is also widespread. Thereafter opinions have varied from declaring that the nations pastures are seriously degraded, risking an ecological disaster, to the view that overstocking is a localized phenomenon and labour availability, not pasture production is the main constraint to herding. While stock numbers are at an all-time high since recording began in 1918, the 1996 levels are only marginally higher than those of 1950. The consensus is that problems vary from place to place and that outlying (summer and autumn) pastures are underutilized, while winter-spring pastures are often being abused. Natural control of stock numbers is the traditional way to correct overstocking. Periodic zud [winter natural disaster - discussed later] or prolonged drought kills large numbers, and puts the grazing stock back in equilibrium with the forage supply, but however effective natural disasters are in protecting the grazing vegetation, they inevitably lead to poverty and suffering among the herders. The vast grasslands of Mongolia are part of the steppe, a prominent transition belt in Inner Asia and Central Asia between their forest and desert belts. Steppe vegetation is characterized by a predominance of grasses, especially species of Stipa and Festuca. Legumes are scarce; the commonest are Medicago sativa subsp. falcata and Astragalus spp. Artemisia frigida is frequent and is the main steppe-forming plant of the desert steppe. The montane forest steppe has Festuca spp. and Artemisia spp. as dominants. There are typical plants associated with the main pasture zones. High mountain pasture is dominated by Kobresia bellardii, Ptilagrostis mongolica, Arenaria, Formosa and Potentilla nivea; Forest steppe is dominated by Festuca lenensis, Carex pediformis, Aster alpinus and Androsace villosa; the steppe zone is dominated by Stipa capillata, Elymus chinensis, Cleistogenes squarrosa, Koeleria macrantha, Agropyron cristatum, Carex duriuscula, Artemisia frigida and Potentilla acaulis; the desert steppe is dominated by Stipa gobica, S. glareosa, Allium polyrhizum, Artemisia xerophytica, A. caespitosa, Anabasis brevifolia and Eurotia ceratoides; and the desert zone is dominated by shrubs and semi -shrubs like Anabasis brevifolia, Salsola passerina, Sympegma regelii and Nanophyton erinaceum. The steppe has five major zones with different livestock production capacities. 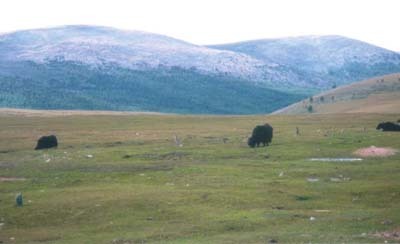 The Khangai-Khosvol region in the northwest is mountainous with scattered larch forest. It includes Arkhangai, Khovsgol and part of Bulgan and Zhagvan aimags; this is mixed grazing, with yaks replacing cattle at the higher altitudes. 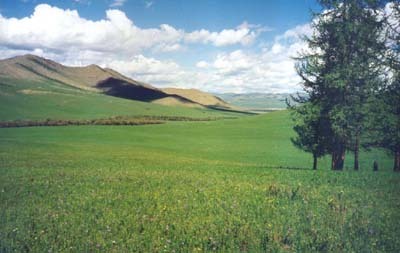 Selenge-Onon in the north central area (Tuv, Selenge and parts of Bulgan) is the main area of agricultural production. These two regions drain to Lake Baikal. Altai (covering Uvs, Bayangol, Khovd and parts of Zhavakan and Gobi -Altai aimags) is a high, mountainous, area with internal drainage and contains large lakes. In the northern part of the region this again is grazed by the main types of livestock with yaks; there is some localized fodder and horticultural production under irrigation in the lower parts. The Central and Eastern steppes (comprising Dornod, Hentii - see Plate 7.9, Sukhbaatar and parts of Dorongobi and Dungovi) are characterized by broad, treeless plains; the Herlen river traverses part of the region; the primary activity is herding of horses, cattle, sheep, goats and camels. Gobi (mainly Bayankhongor, Omnogobi, much of Ovorkhangai and parts of Dungobi and Gobi-Altai) is desert steppe and desert, used for grazing camels, horses, cattle and goats, with very limited hay harvesting; drainage is internal; oases produce vegetables and fruit. 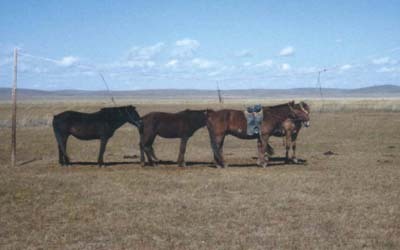 Saddle horses on hitching line in the eastern steppe - Hentii. Some fodder was grown during the collective period, for hay, by negdels and State Farms in the higher rainfall areas. Some silage was made by "mechanized dairies". The area dropped dramatically with the change of system, from 147 000 ha in 1989 (Table 7.4) to 25 000 ha in 1993 and is probably much lower now. Oat (Avena sativa) was the main hay crop; its cultivation suited the wheat-growing equipment already available, a crop could be grown to the hay stage in the short season available, and harvesting and curing was easy. All operations were, of course, mechanized. Locally-saved seed was mainly used. Sunflower (Helianthus annuus) was a common silage crop; in the main crop producing areas it can develop to the full heading stage with seed set, suitable for ensiling, before low temperatures affect growth; it is very drought tolerant. Sunflower seed cannot, however, be successfully ripened in the main silage-making zone; some farms arranged for seed production at lower, warmer sites in Eastern Mongolia, but much of the seed was imported from Central Asia. Alfalfa (Medicago spp.) has been cultivated on a small scale, under irrigation, in the area of the Great Lakes in the northwest for a very long time. This was expanded greatly during the collective period but is now on a lesser scale. Local landraces are grown, probably M. media types, their seed set and production is good in that area; the conditions of western Mongolia are excellent for haymaking. Yellow-flowered alfalfa (M. sativa subsp. falcata), has been grown under irrigation on some State Farms, including Khar Horin. It was also grown on several small irrigated areas in the Gobi. Gobi sites have generally been converted to the more popular and profitable melons and vegetables. Fodder and straw production 1989-1993. SOURCE: State Statistical Office, 1994, quoted by FAO, 1996. Sown fodder does not have a high priority under the present economic and social conditions but could play a role in supplementing low quality winter and spring feed in favoured sites. Oat hay could be developed as a cash crop on cereal farms once the crop industry is re-established. Screening and selection of cultivars will, however, be necessary, as will development of a seed supply chain. 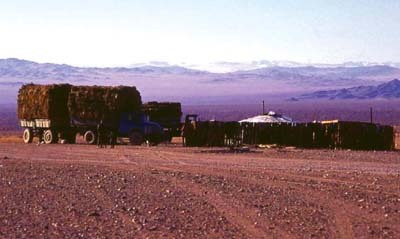 Because of the 1944 zud the government decided to encourage the creation of reserves of fodder by private herders, but this really developed during the collective period. The State Emergency Fodder Fund was set up in 1971, operating twelve centres and forty-one distribution points, but its origins date from the 1930s, when haymaking stations were started with horse-drawn technology brought in from Russia. By 1991, the State Emergency Fodder Fund operated 22 centres; because of financial problems, most were transferred to aimag administrations. The State Emergency Fodder Fund played an important part in reducing the impact of weather emergencies but, as economic liberalization progressed, its ability to continue its role became doubtful since central government could not provide the previous level of subsidy. In 1997 total fodder production was estimated at 340 000 fodder units; the national average was 4.9 forage units per sheep, less than a tenth of the average of 1980. Hay production data for the 1960-1985 period are shown in Table 7.5. In 2000, hay production was estimated at 689 000 tonne. Problems of land use rights are a serious hindrance to herder haymaking; a further problem in some systems is the location of the hay lands: sometimes they are far from the summer pastures (Plate 7.10) and the herders are absent at the haymaking season; sometimes they are far from the spring and winter pastures where the hay is needed. The biggest bottleneck in haymaking by herders is the amount of labour involved and the lack of machinery. Herbage reaches its maximum yield and feeding quality in the second half of August in most ecological zones; this is a season of relatively heavy rainfall and it is laborious to mow and turn low-yielding crops of hay to give a quality product. FAO has provided some support for work on haymaking in Arkhangai by the High Mountain Research Station, based in Ihk Tamir sum, which concentrates on montane pasture and livestock management questions, especially yaks. Arkhangai aimag is in the central area of the Khangai mountains, its headquarters, Tsetserleg, is about 500 km west of Ulan Bator; its latitude is roughly 47° 30? N at 103° 15? E. It covers a range of ecological zones, including high mountain, mountain steppe and steppe zones. Haymaking by producer and year (000 tonne). The average elevation is 1 700-1 850 m; mean annual precipitation 363 mm, of which 80 percent falls in the period May to August; mean maximum temperature in August is around 16.0°C, falling to -16.0°C in the December to February period, with absolute maximum and minimum temperatures of 34.5 and -36.5°C. The aimag covers 55 300 km2, of which 41 000 km2 is pasture, 540 km2 hay and 8 645 km2 forest. The steppe zone, in the east of the province, has the mildest climate: mean January temperature is -16°C (absolute minimum -38°C) and July mean is 17.5°C (absolute maximum 35°C), with 98 to 125 frost-free days. The main ecological zones in Arkhangai are shown in Table 7.6. 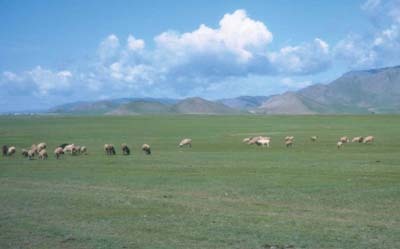 The high mountains are summer yak pasture that is not really accessible to other species, although it can be used for horses. Because of the higher humidity in the high zone, small ruminants suffer there from foot-rot. The area is well -watered by mountain streams and rivers; water for livestock is not generally a problem in the warmer months, although it may be locally. In winter, stock must be watered by cutting through ice to water, or by eating snow, with a consequent extra energy requirement. Forests are common in the mountain and mountain-and-steppe zones: Larix, Betula and aspen in mountain forests; poplar (Populus) and willow (Salix) in riparian forests. Timber and firewood are readily available in much of the aimag. Generally the sward is dominated by grasses, but broad-leaved species, including legumes, are common in areas of favoured moisture status. In the higher grazing areas, Cyperaceae are frequent - the dominant pasture in the high mountains is a Carex -Kobresia community. At present, hay lands are not allocated to herders, so cutting is unregulated and competitive; maintenance or improvement of hay land is therefore impossible. The area of hay land is inadequate for the aimags needs and yields are very low. The growing season is short throughout the project area and scarcity of winter and spring feed is a major constraint to intensification of livestock rearing. Herders are loath to give supplementary feed, except to special classes of stock (milking and pregnant animals; riding horses), because fed animals tend to graze less and come home early to wait for feed. Now almost all hay is hand-mown from natural stands. Yields are very low, 600-700 kg/ha at 18 percent moisture, and haymaking is slow and laborious, and although yields are very strongly affected by rainfall it is likely that most hay fields are declining in yield and quality since they have been mown yearly over a long period without rest, manure or other fertilizer. The High Mountain Research Station has been working on improvement of hay yields from natural stands for some time (variation in cutting dates, dung and fertilizer application, irrigation, etc.). Traditional water-spreading methods practised in the mountain -and-steppe involve sporadic diversion of spring water in winter to develop ice-sheets over hay land, ice which will subsequently melt at the onset of the growing season. Grazing on exposed and sheltered hills is reserved for the winter; autumn and spring grazing takes place on the slopes leading to the higher areas and tree covered areas that will be inaccessible in winter because of deeper snow. Haymaking "fields " (and potential sites), often meadows, lie in these areas in sheltered spots along streams and where natural drainage lines favour a concentration of moisture, one of the keys to good grass growth. These areas would be grazed early in spring (Plate 7.11) and then left for haymaking (and later autumn and winter feed), as the livestock (horses, goats, sheep, cattle and yak are moved down to lower elevations. Haymaking has been carried out for a very long time. Historically, each herder is entitled to use certain land where hay has been cut for many years. After privatization, however, every hayfield has become a focus of disputes between individual herders and members within social groups, as well as with people from neighbouring communities. Also, the repeated cutting of the past few decades has led to a serious decline in the natural productivity of hay fields and there is no sign, at present, that herders will invest in their improvement. Natural hay fields have usually been mown for a long time, so stones and obstructions have largely been eliminated. Further study is required on sources of animal-drawn equipment such as mowers and trip-rakes (carts are available), as well as on how to finance their acquisition and organize their management. Ways of raising yields will also have to be investigated if haymaking is to be improved - haymaking costs, other than cartage and stacking, are proportional to the area dealt with rather than the quantity of hay made. The botanical composition of the hayfields varies, of course, according to site. In the mountain steppe, the main grasses would be Leymus chinensis, Stipa krylovi, Festuca lenensis and Koeleria cristata, with Carex duriscula, Artemisia lacenata, A. glauca, A. commutata and Plantago adpressi as the main herbs. In a riparian meadow, the grasses would be Leymus chinensis, Koeleria cristata and Agropyron cristatum, with Carex pediformis, Artemisia lacenata, Potentilla tanacetifolium, P. anserina, Galium verum and Plantago adpressa. In a rainfed mountain meadow, the grasses and grass-like species would be Agropyron cristatum, Poa subfastigata, Festuca spp. and Carex pediformis, and the herbs would be typically Artemisia lacenata, A. dracunculus, A. glauca, Thalictrum simplex and Galium verum. A mountain meadow on a north-facing slope would have Bromus inermis, Calamagrostis epidois, Elymus turczanovii, Stipa baicalensis and Carex pediformis as the grasses and grass-like species, with Artemisia lacenata, Geranium pratensis and Galium boreale as the main herbs. The overall proportion of plant types in hay is Carex 11-22 percent; grasses 20-37 percent; legumes 6-18 percent; and other herbs (considered to be of poor feeding value) 39-58 percent. Haymaking trials and demonstrations were established in Ikh Tamir district in 1996. Initial trials focused on different rates of dung and their effects, with 50 t/ha being selected as the rate to be used in trials with ice irrigation and mineral fertilizer. Ice irrigation, dung and mineral fertilizer all increased the number of plants per square metre, the length of vegetative shoots and dry matter yield, but it is unlikely that mineral fertilizer will be an economic proposition under present conditions. Differences were particularly significant in 1996, but less so in the dry year 1997. In 1997, increases ranged from 253 percent with ice irrigation to 407 percent with ice irrigation plus dung, and 707 percent with ice irrigation and fertilizer. The percentage of grass on the treated plots rose while that of sedges fell. Land ownership (all land is currently state owned) and continued access to land are key questions. Although families have traditional grazing rights (but not ownership), any move to invest time and resources to increase soil fertility and haymaking brings with it the need for some security of access to an area of land for a reasonable period of time. Herders in Arkhangai made 1 340 kg of hay per 100 head in 1995, less than a twelfth of the official norm. Part of this may be due to herders overestimating the weight of their harvest by a factor of three or four. Two families have recently taken up contract haymaking, with animal-drawn equipment, accepting payment in kind or a share of the crop. Mongolias livestock are raised at pasture in traditional, extensive grazing; this is the best - and in most cases the only - type of exploitation suited to the grazing lands. Livestock are herded on the open pasture, by mounted stockmen, and return to the camp each night, to be penned or tethered, although camels may be left at pasture. The intensive sector, which was government-run on state farms, has largely broken down since it could not be based on natural pasture and depended on large external inputs of feed. Local cattle are poor milkers and exotic dairy cattle require good, warm housing to survive the long winter; provision of feed for housed dairy stock is expensive and forage for the eight-month winter has to be saved during a three-month growing season. Some small semi -intensive dairying is developing in peri-urban areas and where cropping and grazing land intermingle. Swine and poultry numbers have fallen drastically since decollectivization. Dogs were, previously, licensed but are now breeding rapidly and their numbers are uncontrolled. Gid, "circling disease" as translated locally, of sheep is common, according to herders interviewed in all areas, and is related to the dogs that are intermediate hosts of a tapeworm, probably Taenia multiceps, the intermediate stage of which is known as Coenurus cerebralis. The major infectious diseases have been under control for many years through regular vaccination. Recently, veterinary services in the field have been privatized; the state still supplies vaccines, free of cost, for the major diseases, but herders now have to pay their veterinarian to deliver and carrying out the vaccination. Nowadays livestock are privately owned: over 95 percent were in private hands in December 1998; there were 83 600 herding households with 409 600 herders. The average household herd was 170 head; 71 percent of the total herding families had herds between 51 and 500 head. Six species are commonly raised - camels (Bactrian), horses, cattle, yaks, sheep and goats - with their distribution and frequency depending on ecological conditions and pasture type. Although small ruminants are by far the most numerous (Plate 7.12), large stock predominate in terms of livestock units - camels, horses and cattle account for about 69 percent of the total. Some data on liveweight are given in Table 7.9. Currently, the overall livestock population is estimated at over 31 million head; nation-wide statistics from 1918 to 1996 are given in Table 7.10 (yak are not differentiated from cattle and their hybrids, but see Table 7.7). In general, there has been a steady increase in numbers, except for camels, which have declined from a peak of 859 000 in 1960 to 358 000 in 1995. The drop in camel numbers coincided with collectivization, when motor transport became available for moving camp (and probably mechanization of the military) - their lack may be felt by the, now unmotorized, private herders. The traditional livestock are all, of necessity, well adapted to the harsh climate; they can regain condition and build up fat reserves rapidly during the short growing season. The hump of the camel and the fat rump of the local sheep breeds provide energy reserves to help tide them over winter and spring. Yaks, camels and cashmere goats develop winter down among their coats, which helps reduce heat loss. All can survive outdoors throughout the long, cold winter with little or no shelter nor supplementary feed. The young are generally born in spring and their dams benefit from the fresh grass; generalized breeding seasons are given in Table 7.8. The livestock are generally small. Table 7.9 gives the average liveweight of animals sold to the national abattoir, which is probably a fair indication of the general run of stock; some authors claim heavier weights, which are, no doubt, possible with selected or better managed flocks. Sheep and goats being rounded up for milking. Cattle, yaks and their hybrids (000s). NOTE: khainag are yak×cattle crosses. SOURCE: after Cai Li and Weiner, 1995.
early Dec. - late Feb.
early June - late Sep.
late Sep. - late Dec.
Average liveweight (kg) of livestock sold to State Abattoirs. Evolution of stock numbers, 1918-2003 (000 head). NOTE: (1) cattle includes yaks and their hybrids. SOURCE: Ministry of Agriculture and Food; Data for 2003 from FAOSTAT. 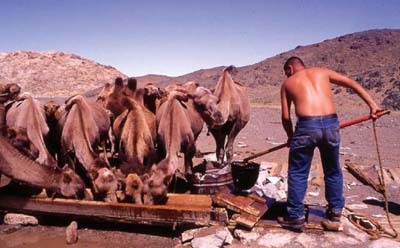 Camels being watered in the Gobi. Bactrian camels are important in the Gobi and other dry regions and are used in many other areas to pull carts or carry baggage; they are the only class of pastoral livestock whose numbers are falling - the decline has been steady from 860 000 at collectivization in 1960 (when motor transport for camp moves became available) to 360 000 today; there is anecdotal evidence to suggest that the fall has ceased and numbers may be beginning to rise. Camels are used for milk and meat as well as transport; camel -hair is a minor but high-priced product. Three breeds are recognized, all from the Gobi, but for moving herders camps, camels are important in most of the country. Camel as subsistence herds and camel breeding is mainly found in the desert and semi -desert zones. (Plate 7.13). Horses of the local breed are small but hardy; they are extremely important as part of the herders essential equipment, as well as for sport, meat and milk - fermented mares  milk (airag) is a favourite, and highly saleable, beverage, although not all areas milk mares - in parts of Western Mongolia, such as Uvs, they are not milked. Only rough estimates of milk yields are available but it is an important revenue source in steppe and mountain steppe zones in places where there are market opportunities; herds of dairy mares are often brought to roadsides in the season. Mares are milked from mid-July through September, sometimes into October, every two to two-and-a-half hours during daylight - about six times daily. Yields are two to two-and-a-half litres - about 150 litres per lactation. In 2001, fermented mares milk was selling at 400 tugriks2 per litre at the roadside, about 40 US cents. Horse -racing is popular and herders selection is for speed. The small local breed of cattle is the basis of the pastoral beef industry; in many areas signs of admixture with exotic blood (Alatau, Simmental and, most obviously, White-faced Kazakh) are obvious, but pure Mongolian prevails in harder areas. They are very hardy, but poor milkers, and most dairy products are reserved for home consumption. Cows are dried off as the feed supply diminishes in late autumn and those that do not get in calf may be disposed of. 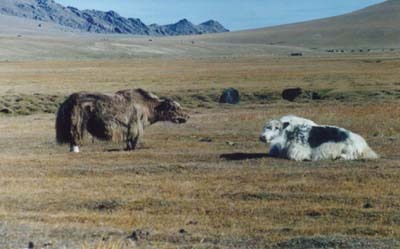 At the colder limit of the range, cattle×yak hybrids (khainag) are also used. Yaks and their hybrid with cattle, the khainag, are kept in the higher areas (Plate 7.14). There are no named breeds, and polled animals are common and are preferred by herdsmen. The proportion of yak and khainag in the national cattle herd fell (see Table 7.7) from one-third to one-fifth between 1950 and 1994. There is some anecdotal evidence that the proportion of yak is increasing again in their main areas. Sheep unlike the other species, have several local breeds, adapted to different ecological zones. These have been described in detail in an article in World Animal Review (Batsukh and Zagdsuren, 1990). Sheep numbers have been declining slowly since 1990. In 1996 there were reportedly 13 560 600 sheep, which was 90 percent of the 1990 figure. Mongolian sheep produce mainly carpet wool and average annual production from adult sheep is 2.0 to 2.4 kg of greasy wool. Mongolian goats are renowned for the quality of their cashmere; their number has increased rapidly in recent years, more than doubling since 1988. This is partly due to the ease of commercialization of a product with a high price-to-weight ratio since the old meat marketing organization broke down; traders now purchase cashmere direct from herders. Goats were traditionally kept in drier areas with plentiful browse - now they are increasing in many areas where previously they were a minor herd component. Production of raw combed product varies from 250 g (female) to 340 g (male castrates) per head. Twinning is commoner in goats than in local sheep, and weaning rates of 100 percent or more are claimed. Polled yak in autumn - Arkhangai. Most of the dairy products of the herding sector are consumed at home. Cows and mares are the main milk sources, but ewes are milked for a few weeks after weaning in some areas. Lactations are short and all cattle are usually dried off by December, when feed has become scarce, to avoid strain on the developing calf. Much of the milk in the short season is processed domestically to conserve it for later use. A wide range of traditional dairy products are made, but clotted cream and dried curd are the main ones. Fermented mares milk, airag, is a favourite and saleable beverage; it is also distilled to produce an alcoholic drink, rakhi, and the residues of the distillation may be added to curd. The numbers of the five species between 1918 and 1996 were shown in Table 7.10. Since grazing pressure depends on species as well as overall numbers, these figures have been transformed into stock unit s (on the basis of the traditional bod) in Plate 7.3. The transformation is crude and does not take account of the different stages of maturity of animals within the herd, but serves for rough comparisons. Present stock numbers are high, but those of 1996, in terms of livestock units, are little higher, by about 6 percent, than those of 1950 immediately prior to the development of collective management. Historically, there was a very rapid rise between 1918, a time of troubles, and 1930, when the national herd reached levels approaching those of modern times. Evolution of the national herd in terms of composition by species and overall size in terms of stock unit s (000s). NOTE: (1) Stock units converted as "bod" values, derived from Table 7.10. From 1961 until the early 1990s, the overall number of livestock units remained relatively stable, reflecting the organized management and marketing arrangements of the period. Since economic liberalization there has been increase in both stock numbers and livestock units, although numbers are rising most rapidly because of the great increase in the goat flock. The greatest increase is in cattle, by about a million, or 12 percent of all livestock units. Small ruminants account for about 30 percent of the total. Between 1950 and 1996, in terms of livestock units, the sheep and goat population was in a very narrow range of between 28.8 and 31.9 million head; large ruminants and horses, therefore, account for by far the greater part of the grazing pressure. Mongolias pastures have, therefore, already carried livestock populations equivalent to modern ones (Table 7.11); how they were distributed in space in the early years is not known. The number of livestock per head of population, however, has been declining steadily since records began, from 34 head (11.6 units) in 1950 to 23.6 (8.1) in 1961, to 16.1 (5.6) in 1970, to 13.4 (4.5) in 1980 and to 12 (3.8) in 1996; the human population, in a largely livestock-based economy, now has only one third of the livestock per capita that it had in 1950. The changes in overall stocking over time is shown graphically in Figure 7.3. Herd composition, of course, reflects ecological conditions and the type of terrain. In Table 7.12 two aimags are compared. One, Tuv, is typical steppe; the other, Uvs, is semi -desert and mountainous. The aimags differ considerably in herd composition. Uvs, being arid, has far more camels than Tuv. The difference in horse numbers is striking, Tuv having double the Uvs percentage; Tarialan, at 10 percent, has a very low horse component. The arid sums have far higher proportions of small ruminants. 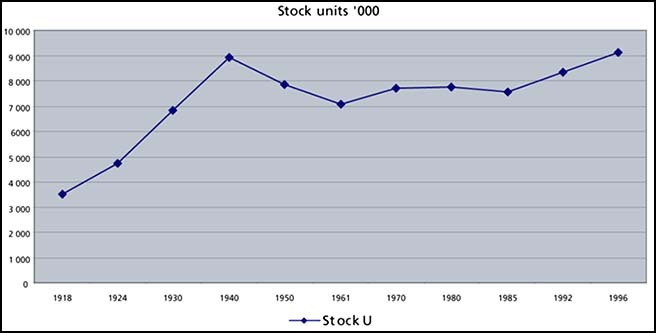 Evolution of stock units over time. Proportion of species in two aimags. SOURCE: Final report (September 2002) of the consultant on haymaking, pasture planning and fodder reserves, prepared for FAO TCP project TCP/MON/0066 - Pastoral risk management strategy. Localized intensive livestock production grew up with the collective movement; both state farms and some negdels were involved. The main enterprises were dairying, using exotic stock in "mechanized dairies", and pig and poultry rearing. All were aimed at supplying the urban market. An Artificial Insemination Service supported the dairy industry. Keeping exotic dairy stock in such a climate was always difficult and expensive, since they have to be warmly housed in winter, and producing or procuring high-quality feed to suffice for the eight- to nine-month period when there is no fresh grass was expensive in cultivated fodder and concentrates, which often had to be imported. Likewise pig and poultry farms were largely dependent on imported stock and feed. Since Economic Liberalization, most of the "mechanized dairies" and piggeries have collapsed, and there is a serious scarcity of dairy products in urban areas. Some small-scale, semi -intensive dairying is developing in peri-urban areas and where cropping and grazing land intermingle, but its progress is slow and economic viability still unclear. Although the first land law was enacted in 1933, the introduction of collective production in the 1950s was the first major change from customary practice. A new law in 1971 introduced a classification of land according to its use, and the responsibilities, the obligations and rights of economic organizations and the administration were defined, and land tenure arrangements introduced. The pasture law of 2002 takes account of the changed political situation and deals with factors such as: individual ownership (by herders, economic entities and organizations) and group owners (bag) of natural pasture and areas for winter and spring camps; rules for use of grazing in emergencies; stock-raising in settled areas; rules for contracting grazing to rights-holders; setting up of inter-aimag and inter-sum otor [using distant pasture for fattening] areas; and granting of haymaking rights to individuals and groups of herders. There are three major periods of otor: (i) spring otor for grazing young grass; (ii) summer otor for developing enough muscle and internal fat; and (iii) autumn otor for consolidating fatness. There can also be emergency movement of large stock to grazing reserves in a hard winter. Customary grazing rights, however, remain powerful, and are a major factor when considering land issues. The regular movement of herds between summer and winter pastures is a widespread practice in pastoral areas of Europe and Asia. The classic cycle is from low ground in winter to mountain pastures in summer, often associated with alpine herbage that is snow-covered in winter. Transhumant grazing systems in Temperate Asia are dealt with in detail by Suttie and Reynolds (2003). The pattern of transhumance in the Mongolian steppe is not usually of this classic kind; most of the precipitation is in the warmer months, windchill is a very serious winter hazard, and livestock are not housed in winter. Winter and spring camps, which are the key to transhumance, are chosen for availability of some shelter and access to forage and water. In the steppe, winter camps may be sited in valleys of suitable hills and in some areas riparian forests provide shelter. There are suggestions that in feudal times much of the transhumance in the non-desert parts of Mongolia was longer, and of the plains to mountains and down again type; these movements would generally have been north-south; the present aimags tend to run east-west and their alignment may have been partially intended to change the traditional migration pattern. Movements may be more vertical in mountain areas, with winter camps generally at the hill-foot; mountain transhumance is usually over shorter horizontal distances than that of the steppe. Access to summer and autumn pasture is less contested than for winter camps and, within a sum or similar sub-unit, may be almost communally used. Grazing circuits cannot be firmly fixed under conditions of great variation in feed availability, which have many weather-related causes; transhumance must be flexible and highly mobile so that herds can be taken to where feed is available, which may be much further in some years than others - this presupposes a degree of cooperation between graziers groups insofar as one group will allow another group emergency grazing should weather events make it necessary. Feed and shelter are not the only considerations governing movement; in some of the mountainous, western aimags, including Uvs, severe plagues of biting insects force the population and their stock to seek high altitudes for the hotter part of summer. Topography may determine migration routes; in high hills, stock movements may be obliged to use passes and this can influence itineraries and grazing systems; passes may only be open for limited seasons and this again affects timing of movements. Detailed studies on systems in Uvs and Khuvsgul are reported by Erdenebaatar (2003). Black zud occurs when, in winter, there is a prolonged lack of snow and continued want of water because of freezing of surface sources, so both stock and herders suffer from lack of water to drink. This type of zud does not occur every year, nor does it usually affect large areas. Wells provide water in black zud conditions, but often a long trek would be necessary and, at the wells, shelter and bedding would not be available in the camping area. White zud is caused by deep and prolonged snow cover (Plate 7.16). It is a frequent and serious disaster that has caused a great number of deaths. Opinion on how deep snow has to be to constitute zud varies: over 7 cm causes difficulties in Khangai yak pastures, while up to 10 cm leaves fodder accessible to small stock in the forest -steppe and steppe; in the steppe of less mountainous provinces, 6 cm is considered a zud. White zud is, of course, more serious if it follows a dry summer and herbage is short. Storm zud is caused by continuous snowfall and drifting over large areas. If it occurs at the coldest time of year it is very dangerous; animals may run many kilometres before the wind and most mortality is through exhaustion or falling into rivers. Khuiten zud is caused by extreme cold or freezing winds; when winter temperatures are 10°C below seasonal averages, stock can no longer graze freely, and expend much energy in maintaining body heat. It usually occurs when night temperatures drop sharply for two or more consecutive nights. Serious losses occur when khuiten zud follows white or storm zud. Drought, from the herders viewpoint, is a lack of rain during the warmer part of the year. Small stock grazing through snow - Tuv. Drought in late spring and early summer is the most serious since, at that season, the pasture recommences growth and the animals are in greatest need of good forage to rebuild body condition and provide milk for their young. Drought over a wide area leads to concentration of livestock around water-points and areas of better grazing and thus causes damage to the vegetation. In higher, cooler, sites, late summer rain has little effect on pasture growth since temperatures have already fallen too low. Stock ownership during the collective period (percentage distrbution on a per head basis). NOTES: (1) Cattle includes yaks and their hybrids. SOURCE: Ministry of Agriculture and Food. Uncontrolled fire can be serious; it rarely originates from, or near, gers or winter shelters since great care is taken in such flammable surroundings. In the mountain regions, unprotected fires of hunters and gatherers of wild fruit are a common cause. While accidental fire destroys standing forage and causes scarcity and wastes much labour in control (to protect gers and property as well as grazing), controlled burning may be used to remove unpalatable old material and encourage a young flush. Predation, mainly from wolves, is an increasing risk now that the premium for wolf -killing has been removed. Protection of snow leopard s in the Gobi Altai raises the problem of how to recompense herders for stock taken by these rare and protected beasts. Stock theft is a very rare risk, although there have been reports recently of trans-border rustling in northern frontier regions. The grazing management of the collective period was based on limited mobility within the bounds of the negdel, and while brigades usually handled monospecific herds, they might overlap in space to provide multispecies grazing of the same pasture for greater efficiency; further mixed grazing pressure was provided by the private stock of the families. The areas and seasons of grazing were specified by management, giving a broader coverage than at present and avoiding undue concentration of stock. Organized marketing avoided both the build up of excess stock and the congregation of camps close to roads and centres. Details of stock ownership in the collective period are given in Table 7.13. Change to private ownership shifted the responsibility for risk avoidance and economic management abruptly from state to household. Herders very rapidly reverted to traditional mobile transhumance in small family groups. Ex-sala-ried staff took to herding with stock allocated to them from negdel break-up, but not all succeeded: 100-150 head is considered to be the threshold herd size for a reasonable living; 50 is the poverty line. In 1995, over 40 percent of households had under 50 head, 45 percent had over 100, and only 15 percent owned over 200 animals. Controlled grazing has gone - in some areas pasture use is anarchic, with immigrant herders trespassing on the traditional lands of others. At neighbourhood and community levels, other customary institutions have re-emerged. Groups provide an approach to regulating access to grazing. They are often kinship-based and related to a natural grazing management unit, such as a valley, or, in dry areas, a water source. Hay and fodder are now negligible - overwintering survival depends on autumn condition and herding skills. Extensive herding, of course, continues, but the controlled grazing of the collective period has gone. The transition has, however, given women a far greater role in decision-making since under the collective all the governmental bodies were overwhelmingly male although many veterinarians are women; women now take an active role in management and especially marketing. Water is a determining factor in pasture use, especially in the steppe and Gobi regions (the mountain -steppe often has plentiful surface water); some areas can only be grazed in winter when snow is available as a water source; elsewhere wells supply, or used to provide, water; in the Gobi, herders movements are governed by watering places. Breakdown of most of the deep "mechanical" water points has rendered many areas inaccessible, especially in the eastern steppe, where gazelle numbers are increasing as they colonize the deserted grazing. Much pasture is not used or is under-used. According to studies by FAO project TCP/MON/0066, as much as one-third of the total may be under-used. 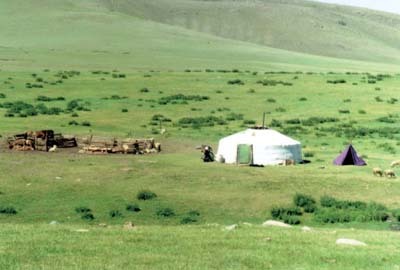 These pastures include areas along the borders, where there are problems of stock theft; in the eastern part, infrastructure is poorly developed and social problems of herders have not been solved; and in parts of western Mongolia there is not enough water and other living materials. In 1990-1997, about 600 new wells were sunk, but 12 800 remained out of operation; 10 700 000 ha of pasture can not be used because of lack of water. Most unused land is far from administrative centres and many herders are increasingly loath to travel so far, especially when infrastructure is deficient. In western Mongolia, where there is shortage of pasture, there are large areas that could be used as joint pasture between aimags, yet they are not fully used. All herding families now keep multispecies herds, i.e. have at least three kinds of livestock that each comprise over 15 percent of the herd; subsidiary species are those forming under 10 percent, such as camels in many areas and yak in the foothills of the mountain -and-steppe zone. Multispecies herds have many advantages, but increase the labour needed for herding. The different species vary in their grazing habits and preferences, so therefore a mixture makes better use of the overall forage available. Yak and horses, for example, can go further into the mountains than other stock; goats and camels make better use of browse. There is a complementarity of species in winter grazing: large stock, especially horses, are used to open trails in heavy snow cover to facilitate grazing by sheep and cattle. A mixed herd spreads risk much more than a monospecific one. Part of the necessity of mixed herds is, of course, the herders needs for a range of products, including transport and traction. At pasture, the species (and at some seasons the sexes may be kept apart) are, of course, grazed in separate flocks. Breeding males may be herded out of season in a communal flock. The degree of attention varies with species. Small ruminants are usually closely supervised and brought back to the camp overnight as they are more prone to attacks by predators. Cattle may be left to graze, except those being milked. Horses often graze unsupervised. Camels are usually left to their own devices except when used for transport. The herders year is divided according to the seasons. The winter and spring camps and grazing are the key to their overall system; each must provide shelter as well as accessible forage through that difficult season. Rights to winter grazing are jealously guarded and are frequently subject to dispute; finding winter grazing is a major problem for many "new" herding families. 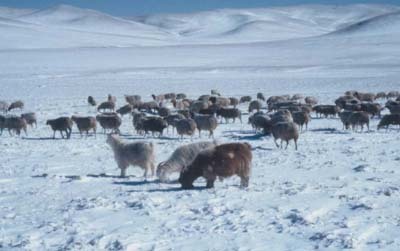 In contrast to many transhumance systems elsewhere, herders often go to the hills in winter to find shelter from the cold winds that sweep the steppe; the hills frequently have less snow and more accessible forage than the plains. Some areas are used in winter because water scarcity precludes their use when there is no snow. Spring grazing is also critical, since it is there that most of the young are born, at a season when feed is very scarce. Summer and autumn pasture is usually grazed in common, with few problems of access or dispute. Taking livestock to more distant fattening pastures - otor - is an important part of well organized herding and, if done with skill, can greatly improve the condition of stock before the long winter. Going on otor, of course, requires effort and labour, and camping away from the main group, and may reduce surveillance of winter camp sites, but it is a key to better herd survival. Many herders now undertake much shorter transhumance circuits than previously. They also produce far less hay. Herders objectives in supplementary feeding are: to minimize loss of condition, ensuring better yield in the coming year and enable early mating, mainly for cows and camels; to improve disease resistance and lessen the incidence of abortion in small stock and mares; to support suckling females and their young; and to maintain working stock. The herders contend that supplements to weak stock, once begun, must not be withdrawn before both weather and pasture conditions are suitable for the stock to forage for themselves. Winter and spring shelters were a very useful innovation of the negdel; they are generally simple wooden structures sited in a sheltered spot and often south-facing; they provide valuable protection to stock. With privatization, no rights to shelters have been assigned to herders, so they are often now dilapidated, although little other than labour input is required to make them useable. Mobility is an essential part of the system; previously ger-moving was facilitated by the provision of motor transport; now herders often have no access to or funds for lorries, and their movements are restricted. Carts and camels are returning as a means of moving, but their number is insufficient; wheels and axles are scarce outside the forest zone and using them to move requires much more labour and time than did a motorized move. With state subsidies for inputs removed and services reduced or absent, herders have reverted to traditional risk -management (in what has always been a risky environment), including keeping multispecies herds and cooperating with other households in herding tasks to help cope with the greater labour needs of diversified herds. The basis of this collaboration is the khot ail, a traditional level of household collaboration, camping and working in a group, which existed before collectivization, especially for summer and autumn grazing. The sur of the negdels partly copied this, but avoided the kinship basis that is common in the khot ail. These units are often, but not necessarily, based on family ties, but associations between households with common interests are as important. 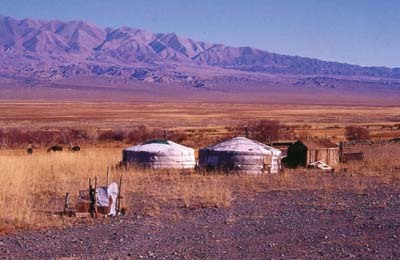 The size of the khot ail varies with season and ecological zone: in the Gobi the khot ail often consists of a single household; in better watered areas up to five households may group together. At neighbourhood and community levels, other customary institutions have re-emerged. At neighbourhood level, groups provide an approach to regulating access to grazing. They are often kinship-based and related to a natural grazing management unit, such as a valley, or, in dry areas, a water source. They exist within the limits of a wider traditional unit, the bag, a customary institution that was responsible for pasture allocation and dispute settlement in the pre-collective era. Present bag boundaries are generally based on those of the brigades. A further type of cooperation is appearing, in that many herders now store their winter gear that is not required on migration; since winter camps are not secure, the storage is often with people settled at the sum centre; payment may be in kind or by other services. "Herders are self-sufficient in meat and milk products and consumption of those products increased by 30 percent and 50 percent, respectively, between 1990 and 1992. In the same period the consumption of other food decreased, e.g. by 40 percent for flour and by more than 80 percent for various food grains. This was a result of the worsening of rural trading services, as herders could only get commodity goods in sum centres, instead of from brigade centres and travelling agents as previously." "There are strong arguments in favour of increasing security of tenure over pasture land in Mongolias extensive livestock sector in order to promote sustainable land management and reduce conflicts over pasture. It is more likely that individualized, private ownership of pasture land, under Mongolian conditions, would actually increase conflict and jeopardise environmental stability, particularly given the lack of administrative capacity to enforce such rights. "While ownership often increases investment and creates a demand for and a supply of credit, since the land would be managed as a capital good in which investments must be made to promote sustainability and prevent land degradation. This assumption does not hold for most pasture land in Mongolias extensive livestock sector in which few if any external inputs are required to maintain productivity. Sustainable pasture management in such an environment depends primarily on mobility and flexibility rather on capital investment. There are certain exceptions: investment may be made in winter/spring camps and shelters and in wells and other water resources and there may be a demand for credit to overcome transport constraints in seeking to maintain mobility. But it is not clear in the Mongolian case that lack of secure title is the principle obstacle to supply of such credit, nor that it could not be satisfied by means of certified possession rights at the level of a group such as the khot ail, which is the appropriate level at which most such investments are likely to be made. "In addition there are strong ecological reasons why the development of a market in pasture land would be undesirable. Sustainable land use under an extensive grazing system requires mobility of livestock between pastures suitable for use in each season. Such seasonal pastures must be shared between neighbouring households since their patterns of movement overlap and vary between years according to forage availability. The spatial arrangement of Mongolian landscapes vary considerably between ecological zones; larger areas are required to encompass land suitable for all seasons in desert -steppe zones, while smaller areas are required in the steppe and mountain -forest -steppe zones. In most cases the risk of drought and/or zud, among other natural hazards, requires that herders have access to traditional areas of pasture for emergency use. 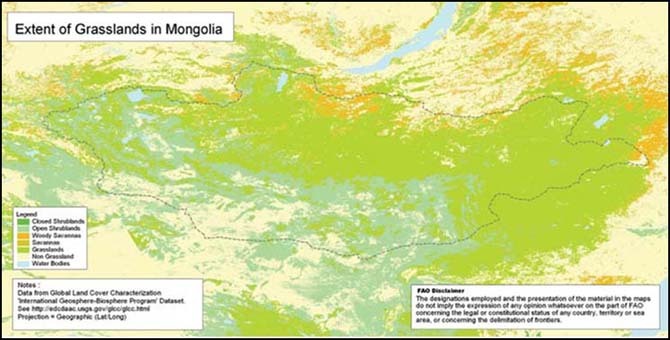 Taken together these factors account for the indivisibility of pasture land in Mongolia below a certain spatial scale varying by ecological zone. On no account should transfers of land be permitted that would fragment in any way these minimum sustainable pasture resource areas." Herders can obtain title to their winter camp-sites, but not to the winter grazing land. Winter migration from drier areas (Plate 7.17) to better watered sums is a serious problem. The incomers can graze all winter, by right, putting great pressure on already heavily used winter pasture. They then graze the early spring growth before returning to their home areas (Plate 7.18). The constraints to sustainable grazing management in Mongolia have been discussed above. The harsh climatic conditions are not a constraint; they are the reason for the extensive, mobile, animal production, based exclusively on natural pasture, that has proved sustainable over many centuries. Many constraints are organizational rather than technical, and have their roots either in the present economic situation of the region or changes in governmental policy during the twentieth century. The main organizational constraint is the lack of recognition, or title to, grazing rights, especially for winter camps and hayfields; legislation to deal with this is under consideration. Lack of regulation of grazing is becoming serious locally, with the abandonment of some areas and overuse of others; a revitalized monitoring system is needed to provide a factual basis for advice and control on the use and maintenance of grazing land. Herders are not organized above the family group, khot ail, level, which is too small for decision-making over the very large areas of land needed for management under extensive herding. 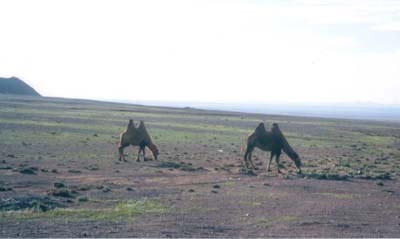 Desert steppe near Khyargas Lake - Uvs. 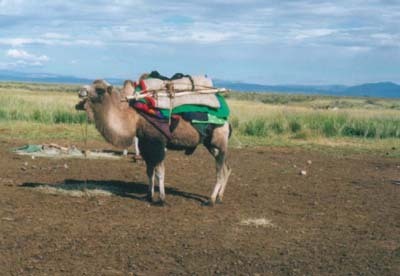 Baggage camel beside marshland pasture by Uvs Lake. Guidelines on grazing management are a necessary adjunct to any advice and control of use; these must be developed with herder participation, after organization of the herding community. National guidelines may be necessary as a framework, but it will be necessary to develop a series of others that take into account the ecological conditions, situation, topography and production systems of individual areas: it is at that level that very close consultation with the users will be necessary. While rising stock numbers are a cause for concern, they were up to near present-day levels during the 1950s; the rapid rise in the human population and the increase in the number of herding families, however, is likely to make control of grazing pressure even more difficult. Herders have been affected by a reduction in the levels of services available and have not yet come to terms with having to help themselves, where previously decisions were taken and services provided centrally. Lack of availability of selected breeding stock is noticeable, although that may change if markets and profitability improve. Lack of marketing infrastructure affects access to outside purchasers as well as both offtake and the quality of products on sale. Similarly, lack of access to consumer goods and supplies reduces the incentive to sell, and may lead to accumulation of non-breeding stock. The closure of the State Emergency Fodder Fund has thrown herders back on their own resources for supplementary fodder supply. Research, training and technical support services now operate on very reduced budgets. Opportunities for improving grazing management and herbage condition while maintaining and increasing output are many. Mongolias grazing lands are well suited to extensive livestock raising and are generally in good condition. Herding has always been the main national occupation, and the people are highly skilled and motivated. They also have the support of a solid body of technical expertise and knowledge. Once legal problems associated with grazing rights have been resolved, coupled with the organization of the herding population, the industry should be able to manage its resources properly while improving the livelihood of the rural population. Many of the actions to remove or palliate these constraints require administrative decisions or actions: definition and granting of grazing rights, probably emphasizing winter camps and hay lands in the first instance; a structure for the organization of the herding population so that they can participate in the regulation of local land use as well as pasture management, development and maintenance, all of which must have functional user participation; monitoring of pasture condition and regulation of its use, which will also require the participation of herders associations, as will the establishment of guidelines (down to local level) on the use of grazing land. Research and training must be maintained and, at herder level, expanded. Rehabilitation of water supplies and revitalization of haymaking are two very obvious activities for better pasture use and stock survival; these can now only be tackled by the herding communities, once organized. Haymaking by individual households needs access to simple implements, security and training. Water development must await both granting of grazing rights and organization of the users before it has a realistic chance of success. Some large tracts of unused pasture were previously reserve otor areas for emergencies and could have been useful in recent zuds; however, to be useful, they require rehabilitation of the water supply and other basic infrastructure, and, when in use, the herders would need access to some sources of supplies and facilities. Stock numbers have risen sharply since decollectivization. A series of consecutive dry summers and the disastrously severe winters of 1999-2000 and 2000-2001 have shown up this lack of preparedness of herders for severe weather. Over 2 million head of stock were lost in each year (see Table 7.14) and much human poverty and misery has ensued. Two consecutive years, 1999-2000 and 2000-2001 have had the harsh combination of drought followed by zud: stock suffering on thin pastures in the growing season and being unable to feed because of hardened snow in winter. This is, of course, a regular risk in herding under such climatic conditions. The greatest disaster was 1944-1945, when 8 million adult stock were lost. Eight zud winters have been recorded since then, the worst pre-2000 being in 1967. These zuds are defined by stock losses, not meteorological data; for much of the time when zud has been recorded there was a well organized system of grazing management, shelters were maintained and winter feed conserved - emergency systems were probably better equipped as well. It is not clear, therefore, to what extent the recent losses are a reflection of severe weather events and how much is due to lack of preparedness by herders and authorities. Stock numbers have risen very steeply since 1990, and this may have been a contributing factor to the severe losses. Livestock losses through drought and zud (head). NOTE: n.a. = data not available. Relief, once zud has struck and local reserves are inadequate, is not only costly, it is often ineffective, since the time taken to procure, mobilize and deliver feed is such that the relief fodder arrives once many stock have died and often spring has come and the grass is greening up. This was strikingly demonstrated in 2001. The quality of fodder used in relief work is another problem: local hay is of low feeding value and the economics of transporting such a poor feed over long distances is dubious. Unfortunately, since Mongolia produces little in the way of crops, cereals, which would be a far better emergency fodder and cheaper to transport, are not available. Following the 1993 zud, "restocking" of herders was undertaken on a fairly large scale in the hope that it would be an effective means of poverty alleviation, notably with IFAD financing in Arkhangai. Restocking is the redistribution of stock to herding families that have herds below the economic minimum. The recent zuds, however, have indicated that such restocking on its own is not really sustainable - restocked herders are just as prone to losses during zud as they were before. Unless the other faults are dealt with - preparedness of herders, maintenance of shelters, reconstitution of emergency services and resolution of the grazing rights problem - restocking is likely to be expensive and of transient benefit. 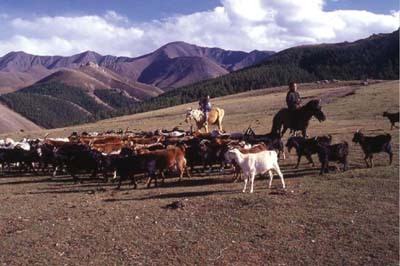 Herding has been almost the sole land use of Mongolia for millennia and its pastures, although hard grazed, are still in reasonably good order. Extensive, mobile grazing systems are therefore sustainable and will continue to be the main economic activity of the country. 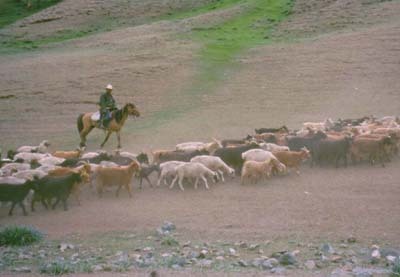 During the collective period, Mongolia maintained a modified system of mobile grazing, using hardy local breeds of livestock and without external sources of feed; its pastures have remained in good order in contrast to most of the neighbouring countries that collectivized their livestock industry. Most of the neighbouring countries (Kyrgyzstan, Buryatya, parts of Northern China) that collectivized livestock modified their grazing systems, often restricting movement or sedentarizing the herders. In some cases, exotic stock was introduced and imported feed brought in, permitting better overwintering but also leading to severe overstocking. Pasture condition in these countries is much worse than in Mongolia; for example, the degradation of pasture in the Ningxia Autonomous Region of China is described by Ho (1996). In the case of Kyrgyzstan, the sheep industry, based on exotic fine-wool breeds and imported feed, collapsed after decollectivization, with stock numbers falling from 9 500 000 in 1990 to 3 200 000 in 1999 (van Veen, 1995; Fitzherbert, 2000), as the exotic sheep could not survive without large, uneconomic inputs. Baas, S., Erdenbaatar, B. & Swift, J.J. 2001. Pastoral risk management for disaster prevention and preparedness in Central Asia - with special reference to Mongolia. In: Report of the Asia-Pacific conference on early warning, prevention, preparedness and management of disasters in food and agriculture. Chiangmai, Thailand, 12-15 June 2001. FAO RAP Publication No. 2001:4. Doc. no. APDC/01/REP. Batsukh, B. & Zagdsuren, E. 1990. Sheep Breeds of Mongolia. FAO World Animal Review. Cai Li & Weiner, J. 1995. The Yak. FAO RAP, Bangkok, Thailand. Erdenebaatar, B. 1996. 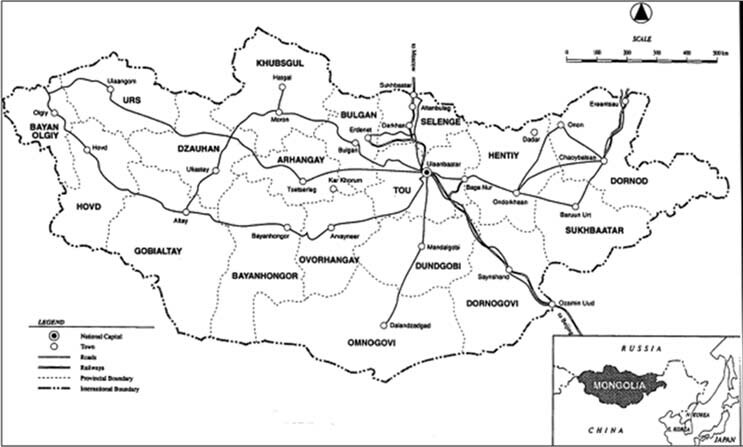 Socio-economic aspects of the pastoral movement pattern of Mongolian herders. pp. 59-110, in: Humphrey and Sneath, 1996b, q.v. Erdenebaatar, B. 2003. Studies on long distance transhumant grazing systems in Uvs and Khuvsgul aimags of Mongolia, 1999-2000. pp. 31-68, in: Suttie and Reynolds, 2003, q.v. FAO. 1996. Trends in pastoral development in Central Asia. Rome, Italy. FAO/UNESCO. 1978. Soil Map of the World. Vol. III: North and Central Asia. Paris, France: UNESCO. Ho, P. 1996. Ownership and control in Chinese rangeland management: the case of free riding in Ningxia. ODI Pastoral Network Paper, No. 39c. Humphrey, C. & Sneath, D. 1996a. Pastoralism and institutional change in Inner Asia: comparative perspectives from the MECCIA research project. ODI Pastoral Network Paper, No. 39b. Humphrey C. & Sneath, D. (eds). 1996b. Culture and environment in inner Asia: I. Pastoral economy and the environment. Cambridge, UK: White Horse Press. Kharin, N., Takahashi, R. & Harahshesh, H. 1999. Degradation of the drylands of Central Asia. Center for Remote Sensing (CEReS), Chiba University, Japan. Latham, R.E. (translator). 1958. The Travels of Marco Polo. Harmondsworth, UK: Penguin. Mearns, R. 1993. Pastoral Institutions, Land Tenure and Land Policy Reform in Post-Socialist Mongolia. PALD Research Report, No. 3. University of Sussex, UK. Mearns, R. & Swift, J. 1996. 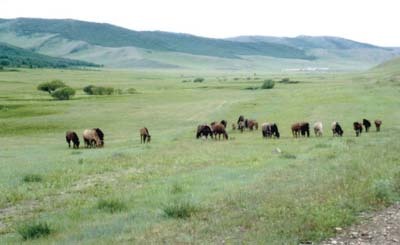 Pasture and land management in the retreat from a centrally planned economy in Mongolia. pp. 96-98, in: N. West (ed). Rangelands for a Sustainable Biosphere. Proceedings of the 5th International Rangeland Conference, 1995. Denver, Colorado, USA: Society for Range Management. Przevalsky, N.M. 1883. The third expedition in Central Asia. Sankt-Petersburg. Quoted by Kharin, Takahashi and Harahesh, 1999: 56. Suttie, J.M. & Reynolds, S.G. (eds). 2003. Transhumant grazing systems in Temperate Asia. FAO Plant Production and Protection Series, No. 31. Telenged, B. 1996. 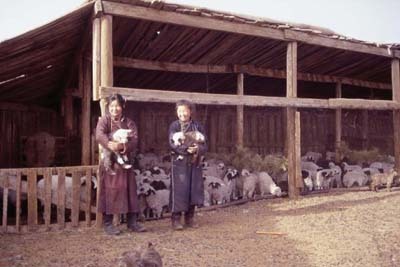 Livestock breeding in Mongolia. pp. 161-188, in: Humphrey and Sneath, 1996b, q.v. van Veen, T.W.S. 1995. Kyrgyz sheep herders at crossroads. ODI Pastoral Network Paper, No. 38d. A large-animal unit: a camel = 1.5 bod; cattle and horses = 1; 7 sheep or 10 goats = 1 bod.